The Best Christmas Present Imaginable…. My New Website! It’s hurtling towards the end of 2016, and I feel my feet have barely touched the ground this year! There are so many exciting projects to look forward to, and I feel totally unprepared for Christmas. The first is my very long overdue new website… Pete and I discussed the plan and design four years ago, and every time I’d saved the budget, it was whisked away by an unexpected expense. Thanks to Pete’s incredible talent for adding virtual buttons and links, and my new logo produced under his graphic designer hat, combined with Catherine’s unbelievable excellence in SEO, and Les Wilson’s perfect photography. There will be new designs, new photography, video, and, dare I say, more pages to add in the new year. A million thanks for your amazing work, and for putting up with the dinosaur I am. A note from Catherine: Please take a few minutes to add a review on my google business listing page, as it will really help my rankings. Many thanks. 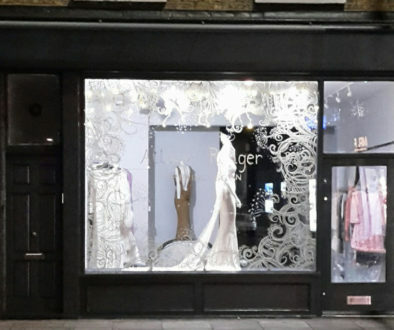 When people say that I’m clever, I know that I am nothing without my incredibly loyal team, and all that they give: Machinists, Amy and Penka; Tailoring, Mr Uddin; Patterns, Arthur; Newsletters and social media, Ashleigh; and beautiful beading and embroidery, Karen and Aruna. My heartfelt thanks, and gratitude to you all. More details and information for the above, available in January. Thank you so much for appreciating, and enjoying wearing the clothes that I love to design. I’m looking forward to lovely new creations, and collaborations in 2017. Now is the perfect time to wrap up, wearing a snuggly shadow fox fur gilet. They are so on trend, with a glamorous edge – from sophisticated shopping attire, to stylish nights out – all events are covered. 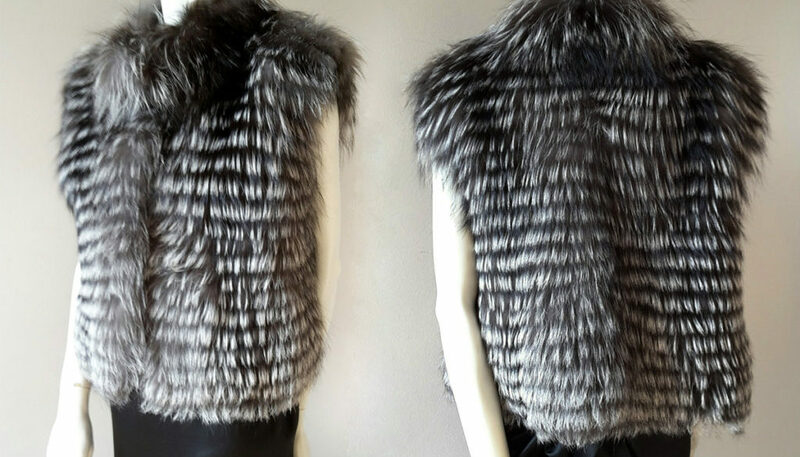 Main image above – Horizontal striped fox fur gilet. Below – Vertical striped fox fur gilet. For an elegant, trendy loose cut style, here’s a wine-coloured batwing jacket. It’s made from racoon fur, and reminiscent of the flattering 1950’s swingy shapes. Stepping quickly into full on glamour, here’s a forgotten evening dress, which I’ve neglected to show or photograph. However, the daylight was amazing, and has captured the drapes and folds of this beautiful silk satin dress perfectly. Teamed with this incredibly glamorous stole in ruby fox fur, the look is perfect for a grand entrance. This beautiful gold French lace was especially made. The subtlety of it’s beauty is provided by the tulle being a very dark chocolate colour – not so severe as black would be. I adore the golden corded design, worked around the pattern of silvery gold metallic lace, and with it’s deep border. The dress is a simple A-line shell, worn over a champagne silk crepe shoestring slip. I love the easy to wear, modern silhouette, contrasted with the vintage appearance of the lace. A beautiful fox fur collar keeps shoulders warm, and provides a softly elegant frame for the face. For the ultimate in feminine dressing up, here’s a pretty salmon pink Lottie dress. Made from Italian wool crepe, and shown with a matching felt headpiece by Siana Yewdall. To finish the outfit, perfect for a spring wedding or special occasion, wear with the back-fastening crop jacket, having matching textured trim on the sleeves. 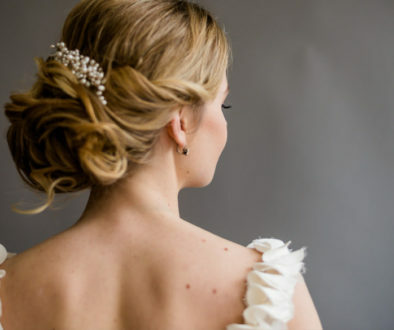 ” I cannot thank Allison enough for creating my dream wedding dress. The whole dress-making experience was one I will never forget – how spoiling and special. Within the first 5 minutes of meeting Allison, she successfully managed to sketch my perfect vision of my ideal dress. I wanted something quite natural and delicate, with an ethereal feel to it for an English country woodland wedding. Allison listened to my ideas, but also my concerns for a dress to be feminine and soft that would also flatter my figure. Thanks to her exquisite attention to detail, her years of knowledge, and her creative talent, Allison successfully achieved all of this and more. My dress was absolutely perfect, it was even more beautiful than I envisioned in my mind. The flattering corset, the soft chiffon lace, the embroidered butterflies and leaves that also sparkled down my veil, my dress was flawless. Thank you again for being simply incredible. Thank you also to Alfie the dog for his approving looks when needed. Fenella’s dress was made from the finest Italian silk chiffon, so light and flowing, that it resembled a translucent spider’s web. It’s surprising to know that underneath, was an underwired corset, holding everything in place! Between these layers, the silk marocain bias fishtail skirt hugged Fenella’s gentle curves, and provided an understated, elegant silhouette. The most beautiful feature of the dress is the exquisite embroidery and beading. Fenella wished to include butterflies and floral shapes, which were embroidered densely around the shoulders, and hems, then trailing asymmetrically down through the body to the hipline, and upwards from the hem. Tiny glass beads and Swarovski crystals gave texture and twinkled in the light. To complete the look, we made a tulle veil to compliment the dress, a few inches longer, and also finely edged with matching embroidery and beading. Despite the ethereal look, and lightness of the dress, it also performed well on the dance floor!